Whilst enjoying a coffee in the Rest & Be Thankful cafe on the Great Orme in Llandudno this morning, my eye was caught by a counter display. 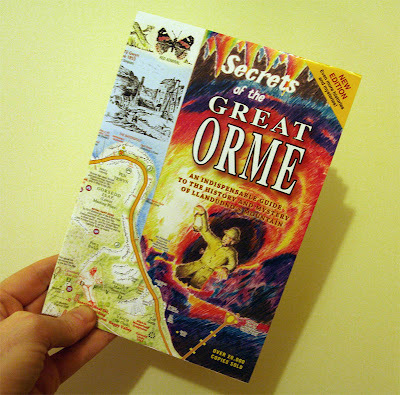 I was slightly thrilled to see that it contained an updated version of a long out of print guide map to the Great Orme called Secrets of the Great Orme, originally compiled by Alan Collinson Design back in the 1980s. If you're even remotely interested in the Great Orme, then I urge you to get this map, it contains a remarkable amount of information (some of it little known) and acts as an excellent guide to the headland. Besides showing all the roads, paths, cafes, toilets, area of interest, it also shows such things as every mineshaft (and there's quite a few) and even shows the routes of the underground mine passages. There's numerous little snippets of history and folklore, together with a guide to the plants, birds etc to be found on the Orme. At £2.50, it's worth every penny. I've only seen it available from the counter of the Rest & Be Thankful cafe, though.